CHECK OUT OUR STORE FOR MORE HARD TO FIND, RARE AND SIGNED PHOTOGRAPHY BOOKS. BOOK DESCRIPTION: SIGNED COPY Gottingen, Germany & New York, Steidl/Dangin Publishers. 2004, Softcover in cardboard slipcase with titles printed in black to front panel. Limited Edition of only 1000 individually numbered copies. Unpaginated with 60 color gatefold illustrations. Boldly SIGNED by Paolo Roversi in on the blank page of the first gate fold. BOOK CONDITION: Fine; a solid, tight, clean copy showing slight rubbing to covers and offsetting of Roversi's own signature in silver onto the opposite page showing the first image in the book. Delicate slipcase shows light wear to edges and corners with edges being tender from use. The item "SIGNED PAOLO ROVERSI STUDIO RARE 2004 STEIDL LTD ED 1/1000 IN SLIPCASE FINE" is in sale since Saturday, April 8, 2017. This item is in the category "Books\Antiquarian & Collectible". 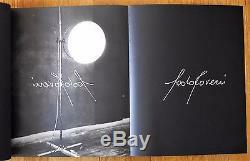 The seller is "studiobooks1" and is located in New York, New York. This item can be shipped worldwide.